For Humidity Calibration Click here! 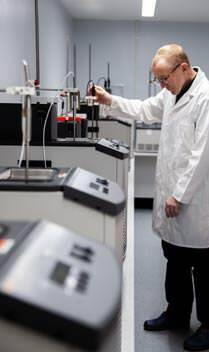 ETI's in-house UKAS calibration laboratory for temperature has a wide measurement range of -100 to 200°C with a best measurement capability of 0.02°C. The laboratory can also measure resistance up to 16MΩ (i.e. resistance decade boxes and PT100/RTD temperature simulators) and DC voltage 0 to 200 mV (i.e. thermocouple simulators and calibrators). Having achieved accreditation to UKAS, our in-house laboratories are inspected on a regular basis to ensure that our calibration methods, equipment and personnel are maintained to the standards required by UKAS and BS17025. Original UKAS Certificates provide proof that instruments and probes have been calibrated against nationally approved standards. View a PDF of our certificate by clicking here. Each standard UKAS Certificate indicates the deviations from standards at various check points -18, 0, 40, 70 and 100°C with a guaranteed uncertainty, dependant on the probe type, see best measurement capability table below. Each UKAS Certificate indicates the deviations from standards at specific check points (-18, 0, 3, 70 and 100°C) to an uncertainty of ±0.1°C. Other temperature points available on request. Each UKAS Certificate indicates the deviations from standards at specific check points (-20, 0, 100, 195 and 500°C) to an uncertainty of ±0.15°C. Other temperature points available on request. Each certificate indicates the deviations from standards at three check points (-18, 0, and 40°C) to an uncertainty of ±0.04°C. The results are recorded and include each data logger's serial number, type and model. For temperature calibration prices and procedure and to obtain a pre-order quotation please click here.